During pregnancy, the health of the mother and her child are extremely interwined. It is a wonderful time of growth and quite frankly, a miracle. However, pregnancy is also a highly sensitive period, during which the mother and baby must be diligently monitored and cared for by the medical professionals tasked with protecting their health. Although thousands of pregnancies are entirely successful, thousands more present complications that can threaten the wellbeing of both mother and infant. The placenta is an extraordinarily significant component of pregnancy that, if jeopardized, can cause severe consequences or even death. 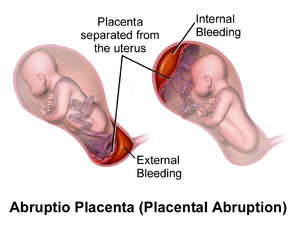 One potential placental complication is placental abruption, which occurs when the placenta becomes separated from the uterine wall. When placental abruption exists, it is imperative that doctors identify the signs and take immediate action to prevent harm to the woman and her child. Failure to do so can result in permanent harm or, worse, prove fatal. At Fronzuto Law Group, our highly skilled New Jersey medical malpractice attorneys represent victims who suffer harm as a result of birth injuries, delivery errors, and obstetrician malpractice, including mothers and babies who are injured as a result of failure to diagnose or properly treat placental abruption. With a firm that concentrates on the highly complex area of medical malpractice litigation, we have achieved millions of dollars in verdicts and settlements in cases ranging from epidural abscess and cord compression to infant respiratory distress. Our commitment is simple: provide superior representation and client service to each and every one of our clients. In fact, we purposefully limit our caseload to achieve these ends. To schedule your free initial consultation with one of our New Jersey birth injury lawyers today, call 973-435-4551 or contact us online. Placental abruption can develop slowly over time or the mother can have a sudden onset of symptoms. Vaginal bleeding can be severe or mild, but this does not necessarily correlate with the extent of placental separation from the uterine wall. When placental abruption occurs, both the mother and child are at acute risk of suffering serious complications. For the mother, placental abruption can lead to heavy bleeding, excessive blood loss, shock, and even death. For the infant, placental abruption can lead to oxygen deprivation, resulting brain damage (hypoxic brain injury), Cerebral Palsy, or loss of life. Because placental abruption is an emergency situation that can spell permanent, severe harm for the mother and baby, doctors must immediately recognize symptoms, diagnose the condition, and take appropriate measures to prevent further complications. Necessary treatment for placental abruption is contingent upon the degree of abruption and the potential threat to the mother and child. In some cases, bed rest and continued monitoring is sufficient, while in others, an emergency C-section and/or hysterectomy is required. At Fronzuto Law Group, we recognize the toll that medical negligence can take on you and your family. With millions of dollars recovered, we aggressively advocate for your and your child’s interests and work tirelessly to obtain the compensation you so greatly deserve. Contact our offices at 973-435-4551 for a free initial consultation about your unique circumstances and learn more about your potential legal options. Can Vaccinations Lead to Medical Malpractice Claims? Copyright © 2019 Fronzuto Law Group. All Rights Reserved. This web site is designed for general information only. The information presented in this site should not be construed to be formal legal advice nor the formation of a lawyer/client relationship. Our renowned attorneys represent victims of medical malpractice, pediatric malpractice, birth injuries, and dangerous or defective products in Atlantic County, Bergen County, Burlington County, Camden County, Essex County, Hudson County, Hunterdon County, Mercer County, Middlesex County, Morris County, Monmouth County, Ocean County, Passaic County, Somerset County, Sussex County, Union County, and Warren County, New Jersey.